There are many Websites to help search for Houses to purchase or Rent and most of which have Apps for Android smartphones. You might be looking for a certain type of flat or house in a certain locality and with some specific amenities which are not always made available in most of the Websites and Apps. Selecting a House to Buy, Sell or Rent is a big deal for families, Job searchers who plan on shifting from one locality to another locality or from one city to another city due to Job transfer or for children’s schooling as mentioned above it involves many factors which makes it difficult to finalize on a house which you feel is perfect for you and your family. 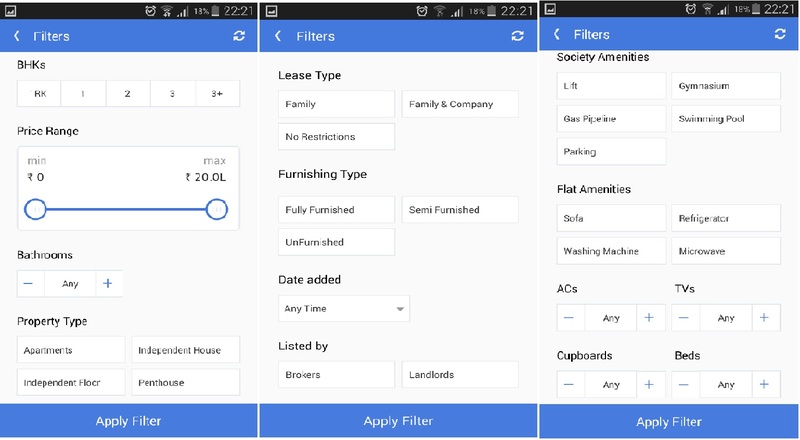 There are many apps which are present at the moment which will let you choose to Buy, Rent and even Sell your house or put up your house for sale or rent but the one we found the most helpful in all terms like interface and filter options is housing.com. This app also has options to search and choose Hostels and PG for Boys and Girls, which can be really helpful for students and employees who have shifted to a new place away from their home town and are searching for hostels. Coming to the features of the App the main thing which stands out is the user interface which is simple and neat and directly to the point. 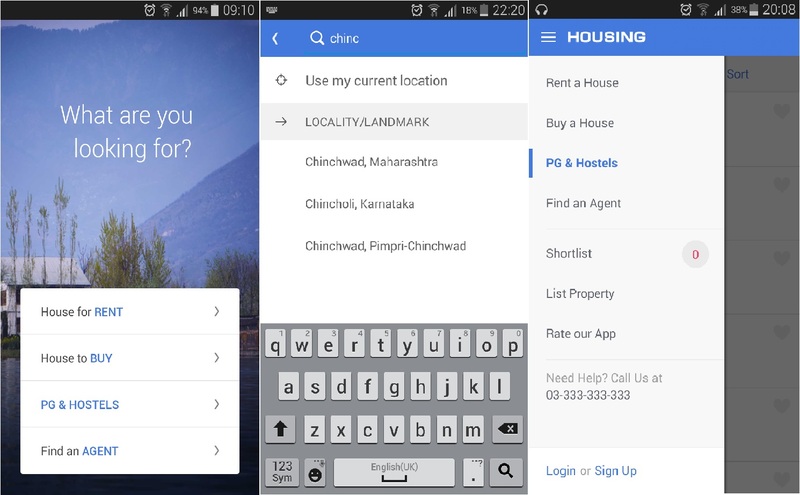 On launching the app the following four options are shown House for Rent, House to Buy, PG & Hostels, Find an Agent. You can directly select from the options which you want. After selecting the option you can now filter based on your requirements using multiple filters which are shown in the images. Another important and main option is the presence of Photos on all the listings which are not user uploaded but by Housing.com staff themselves which gives a precise feel of what the property looks like in real. The presence of Search Filters makes it even more precise to sort out from the huge number of listings by selecting the amenities like Price, number of bedrooms, size and presence of other amenities like Furnishing, AC’s, Car parking etc. Sorting out Real Estate: As soon as the app is launched you get four options to choose from, this first step instantly starts to sort out listings to help narrow down your search results. You can choose from House for Rent, House to Buy, PG & Hostels, Find an Agent. Pin Point the Location required: You can enter the desired location to narrow down your search location. You can Enter City name and then can choose from the locations which are present in the options given or enter the Locality name or any Landmark around which you are looking for. For example if you are looking for any flats on sale in chinchwad in Maharashtra then you can enter either Chinchwad directly or any location nearby like chinchwad station to get precise location of flats available for sale in that area. If you are present in a certain location and are looking for properties there you can search for listings by selecting present location. Use Filters to sort properties based on requirements: The presence of filters in the search results makes your search even more precise and helps you to find the type of property with the required amenities which you are looking for. The types of filters which are available with Housing.com are number of Bedrooms, price range in which you are looking for, bathrooms, property type (Flat, independent house or land), lease type, Furnishing, Date at which it was added, Added by ( Broker or Landlord), other Amenities like Lift, Gymnasium etc, Society Amenities, Flat amenities, Ac’s, TV’s, Cupboards, Beds. After choosing the desired Filters you can Apply the filter to sort out and get the final results for the House or Flat which you are looking for according your needs and wishes directly from the palm of your hand. Short listing Properties: You have the option to short list properties which you have seen and liked to later compare and finalize on one property in the end. This feature allows you to not waste much time and to save the properties which were liked and then compare them against each other and finalize on a single property later on. You can directly finalize and get the contact details of the broker or landlord who has listed the property. This I must say is the leading property listing site which gives you maximum details in the most neatest and simplest way possible with the help of an amazing interface in the Android app. We see that when a Website is converted to an App many features are not made available but in housing.com the App is at par with the Website with all the features made available in the App as well. The presence of various filters will make sure that all the unwanted properties and listings are removed from search results making it both useful and time saving. And to make sure that all the amenities and the features which we are looking for in a house is fulfilled. Another great feature is the presence of map in the listing which will let you pin point the exact location and also lets you go directly to the flat or house following the map. What many people found beneficial was that the listing provided the details about amenities like AC, furniture etc which will help someone who is not willing to carry around all furniture to a new place but are looking for furnished places. Another advantage is the presence of Photos which are taken by Housing.com employees themselves which will provide you exact details about the property both the good and bad about it will be shown in the photos, which might not be the case if the user uploads the photos themselves. The credibility of this property listing service is one of the best. If you have found a suitable property for your needs you can directly get the contact details from the listing and will show you if it is the Landlord or a Broker whom you are contacting. So if you are looking for any properties be it a Flat or House for Rent or you want to purchase a Flat, House or Land. If you are a student who is looking for a Hostel to stay can also find them with photos and details like amenities and location to help make you decide and finalize on certain places before hitting road and checking out each property in detail. This is one of the best property listing site which gives you all the details which are needed to select and decide on a property before going there personally to finalize the deal. This makes it even more beneficial if you are looking for a property in another state or city as you can directly go the properties which you have shortlisted. So if you are looking for a property then this app is the first to go for which is available in Play Store for Free and you do not have to pay any brokers to show you properties and pay them for the service you are getting it for free from the palm of your hand.